President Moon Jae-in's approval rating slightly rose this week after slipping to an all-time low, a poll showed Friday. Moon's approval rating came to 60 percent in the latest survey conducted by Gallup Korea. 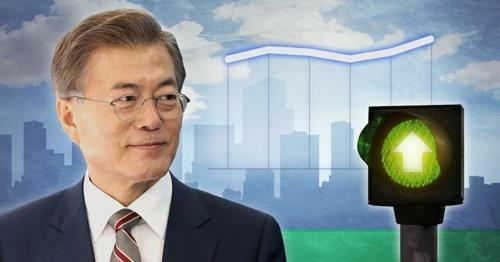 The reading marks an increase of 2 percentage points from a week earlier when Moon's approval rating dipped to the lowest since taking office in May 2017. Despite the slight increase in his approval rating, those who disapproved of the way the president managed state affairs also increased to 32 percent, up 1 percentage point over the cited period. The latest survey was conducted on Tuesday and Thursday, involving 1,002 adults throughout the nation. The local pollster did not offer any specific reason for the increase in Moon's approval rating, but the rise follows an agreement with North Korea to hold the third inter-Korean summit between Moon and North Korean leader Kim Jong-un in Pyongyang next month. Moon and Kim held their first summit in the border village of Panmunjom on April 27, followed by their second meeting also held in Panmunjom on May 26. The Pyongyang meeting, if held, will mark the fifth inter-Korean summit in history. The two previous inter-Korean summits were held in 2000 and 2007, involving then South Korean Presidents Kim Dae-jung and Roh Moo-hyun, respectively. The approval rating of the ruling Democratic Party too advanced amid renewed hopes for improved inter-Korean ties. The party's own approval rating surged 4 percentage points on-week to 44 percent, while that of the main opposition Liberty Korea Party remained unchanged at 11 percent. The minor opposition Bareunmirae Party's rating gained 1 percentage point to 6 percent, with that of the progressive Justice Party shedding 1 percentage point to 15 percent.